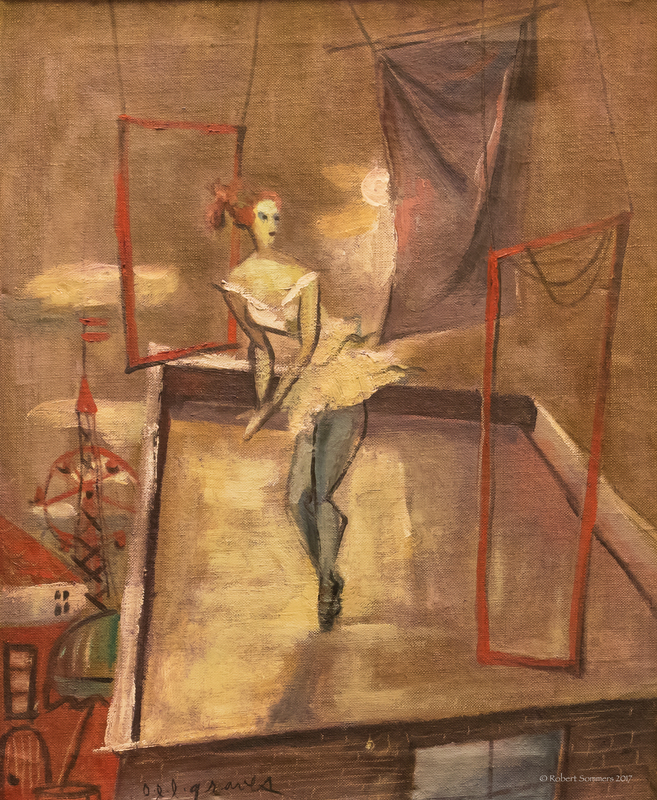 OEL Graves (1897-1971) Dancer oil on canvas 24 x 20″ framed, needs minor restoration to thin area bottom center. p.o.r. O.E.L. Graves has had a long, varied career as a painter, starting as a youth in London shortly preceding World War I. He has had no formal art education, but has been drawing and painting all his life. He is completely self taught. His Sculptured Paintings are the culmination of almost a lifetime of creative plastic activity. Mr. Graves does not take nature as a starting point. Like most importatnt of the creative painters of our time, Miro and Klee, these paintings are the deepest exploration of his subconscious and evolve automatically. It is not until the painting is almost completed that the painter sees some relationship to the world about him, or the subject reveals itself. However, at all times during the progress in painting the picture the artist strives to meet his exacting standards of color harmonies and textural quality. The paintings are built up heavily with oil on masonite or board, and then cut with a chisel or knife. There is a third dimensional sculptural quality and variegated patterns of color relationships creating abstract forms. The surface quality is one of lava or stone, with a patina of age and a gem-life quality.